Buster Crabbe’s role as Tarzan in a 1933 movie serial was the beginning of a long career that lead to over 100 movies. 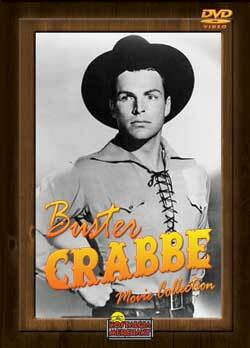 In the 1940’s Larry ‘Buster’ Crabbe began a series of westerns that proved to be as popular as any western hero. Here is the amazing Buster Crabbe movie collection of 14 feature films. MOVIE TITLES: Billy the Kid Wanted (1941), Western Cyclone (1943), Blazing Frontier (1943), Devil Riders (1943), Frontier Outlaws (1944), Rustler’s Hideout (1944), Valley of Vengeance (1944), His Brother’s Ghost (1945), Gangster’s Den (1945), Stagecoach Outlaw’s (1945), Prairie Badmen (1946), Fuzzy Settles Down (1945), Outlaws of the Plains (1946), Gun Brothers (1956).